ShrinkingKitchen.com's recipe for healthy honeyed yogurt dip is a recipe for fruit dip that uses cream cheese and yogurt. This recipe uses light cream cheese and fat-free yogurt to make a low-fat dip. To make Shrinking Kitchen's healthy honeyed yogurt dip, combine 8 ounces light cream cheese, 8 ounces fat-free plain Greek yogurt, 1/4 cup honey, 1/4 teaspoon cinnamon and 1/2 teaspoon vanilla extract in a bowl. Mix until fully combined. Refrigerate the mixture for at least 1 hour. Serve with sliced fruit such as strawberries, apples and pears for dipping. DietHood.com also offers a recipe for fruit dip that uses both yogurt and cream cheese. To make this recipe, beat 8 ounces low-fat cream cheese in the bowl of an electric mixer until creamy. 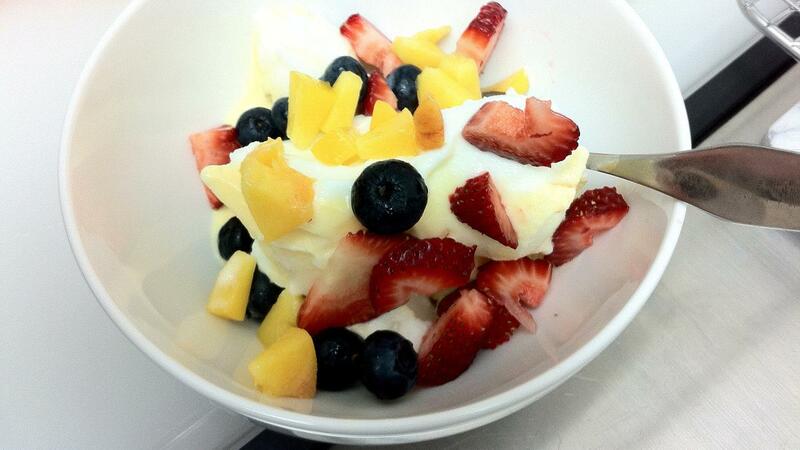 Slowly add 8 ounces of low-fat plain yogurt and continue mixing until combined. Add 1/4 cup packed brown sugar and 1 teaspoon vanilla extract. Stir in 2 tablespoons of milk or more until desired consistency is reached. Refrigerate for 1 or 2 hours. Serve with sliced fruit for dipping. BettyCrocker.com's recipe for strawberry marshmallow fruit dip uses strawberry-flavored yogurt. For this recipe, combine 4 ounces low-fat cream cheese, 1 cup marshmallow fluff, 6 ounces fat-free strawberry Greek yogurt and 1/2 cup chopped strawberries. Beat with an electric mixer until well combined.